Elsie Eliza Duckworth married William Raymond Houghton, son of William Charles Houghton and Jessie Cassidy, in circa 1920 age 22 and 19. Patricia A. (?) married Kenneth E. Houghton, son of Harry Houghton and Lois (?). Death Sep 24, 1972 He had a heart attack Sept 1972 and died two days later. 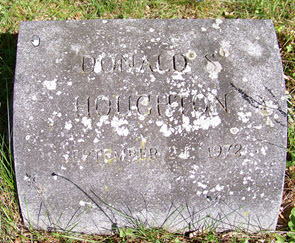 Donald Soley Houghton married Barbara Ruth Koch. 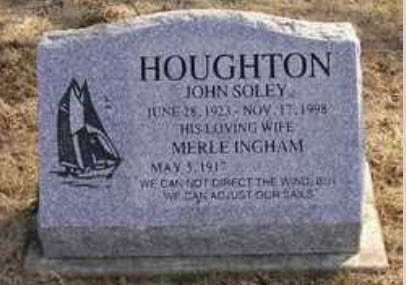 John Soley Houghton married Merle Averille Ingham. Gertrude D. Garceau married (?) 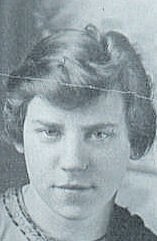 Houghton in circa 1921 she age 20. 1880 Census 1880 Louisville, Jefferson Co., KY, USA, age 40, grocer; John, age 52, "invalid, now in Ireland"
Richard R. Houghton married Gail Elizabeth Abbott in Aug 14, 1959. Gail Elizabeth Abbott married Richard R. Houghton in Aug 14, 1959. Ann M. (?) married Charles Houghton.